Smartphone speakers are a mixed bag, but most of us make the best of what we have. While more and more people seem to be audiophiles and are making their audio opinions known online, there comes a point where you might say a smartphone speaker isn't enough. The question is then which are the best external speakers? Nokia are keen to push NFC paired Bluetooth speakers which come with hefty price tags. 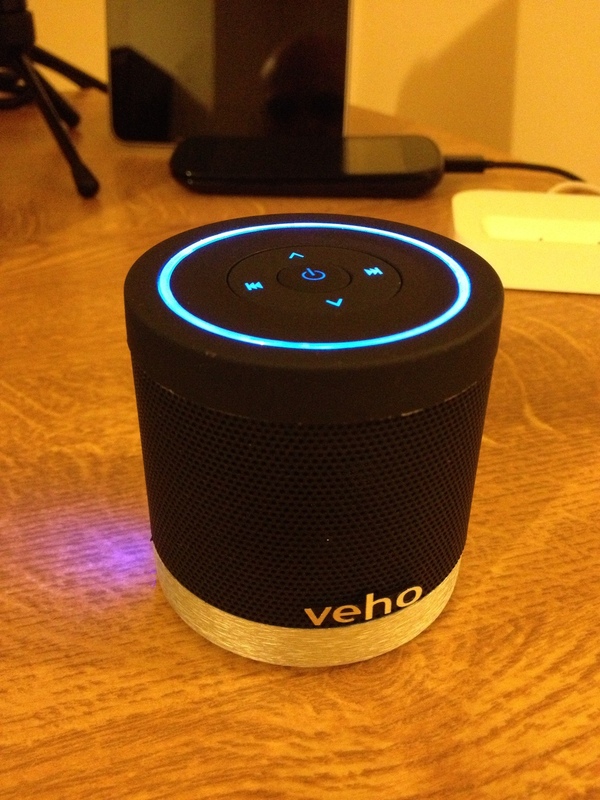 Today's review looks at the more affordable Veho 360 M4 Bluetooth speaker. 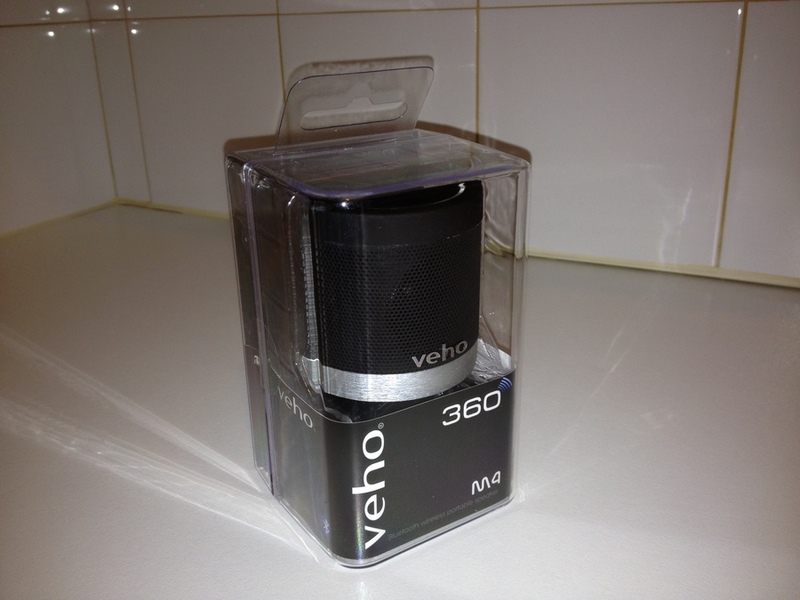 On first impressions, the Veho 360 M4 (which I'll refer to as M4 for short) looks like a stylish piece of kit. When I first handled the packaging it was so heavy I assumed it must have been supplied with a mains adapter. I was wrong, there was no mains adapter – the speaker itself is actually quite hefty. That is partly explained by the fact that the unit contains two speakers to cover all directions, hence the "360" name. Its weight isn't a problem though as the speaker will be sat on a desk most of the time, and before too long you forget the weight is there whenever you pick it up anyway. The speaker is matte black with a faux brushed metal bezel around the bottom of the unit. The speaker grille wraps around the circumference of the device, and is a coated metal sheet with honeycomb matrix of circles punched out to let the sound through. While the M4 looks stylish from a distance, up close there are a few chinks in this dark knight's armour – literally. The review unit I received was quite scratched up on the metal-effect bezel. Also, I could see the Veho badge did not quite lay flat to the tubular grille. Also, when you turn the device on, it makes a distorted iPhone-esque chime at full volume which is not exactly discreet. None of these issues are ultimate deal breakers, but they're all little slips in quality control that do not inspire confidence in one's purchase. 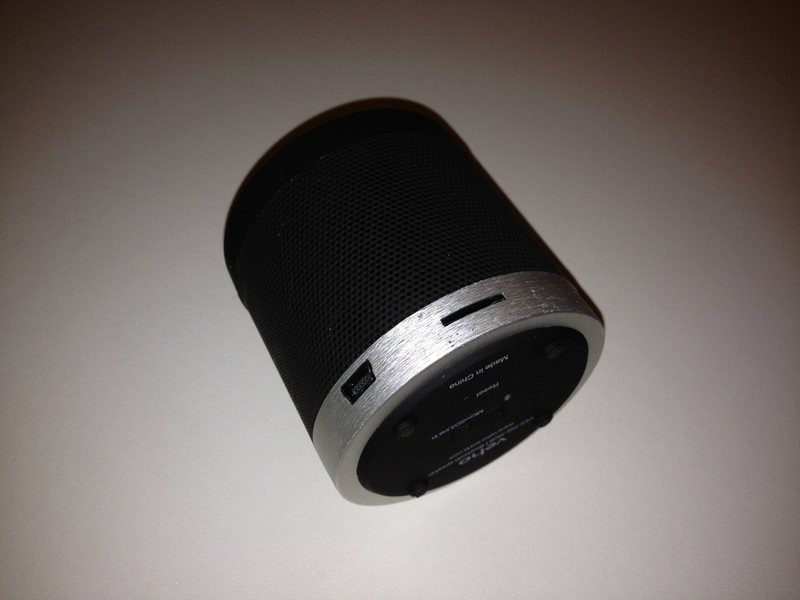 The speaker is 6.5cm high and has a 5.5cm diameter. In addition to Bluetooth, the M4 can also take input from a 3.5mm line-in socket and play MP3s and WMAs via a microSD card slot. The speaker has 600mAh battery, which is charged via a Mini USB port. 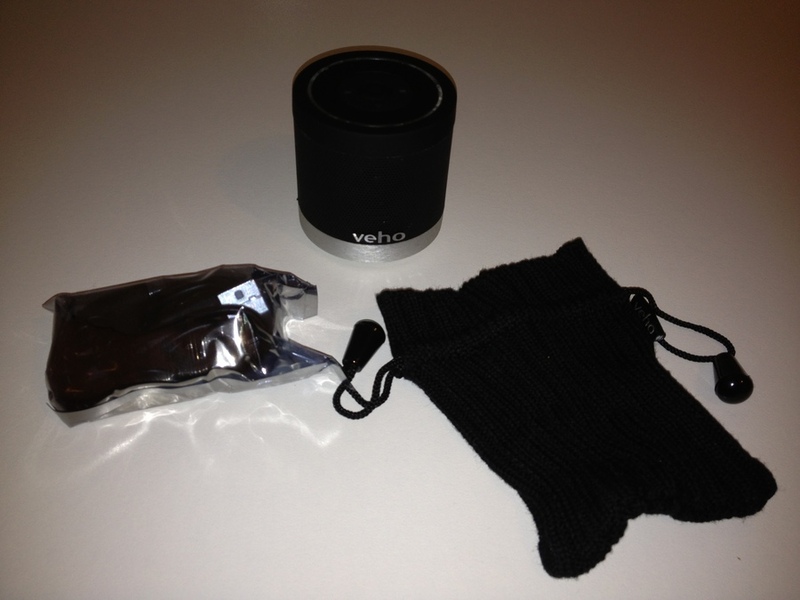 The speaker is supplied with a Mini USB to Type A USB cable, and a male 3.5mm to male 3.5mm stereo cable, plus a knitted sock to carry everything in. 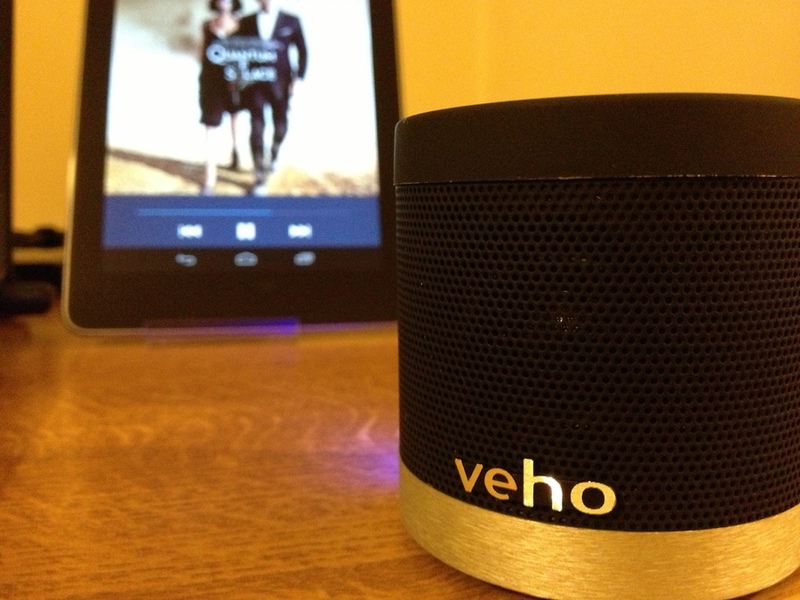 Veho claim the 2x 2.2 Watt speaker unit can play via Bluetooth for 5 hours. In my testing, that figure is more like 2 to 3 hours of continuous playback, and as long to recharge. The top of the device is encircled by a blue LED ring which serves no purpose other than to show the device is switched on – oh, and to look cool. I know, blue LEDs are so 2003, but I still like them, you may not. It's certainly no good for the bedroom unless you like a night light! In addition to the blue ring of power (ahem), there is a power button in the centre, which is encircled by a d-pad type button. 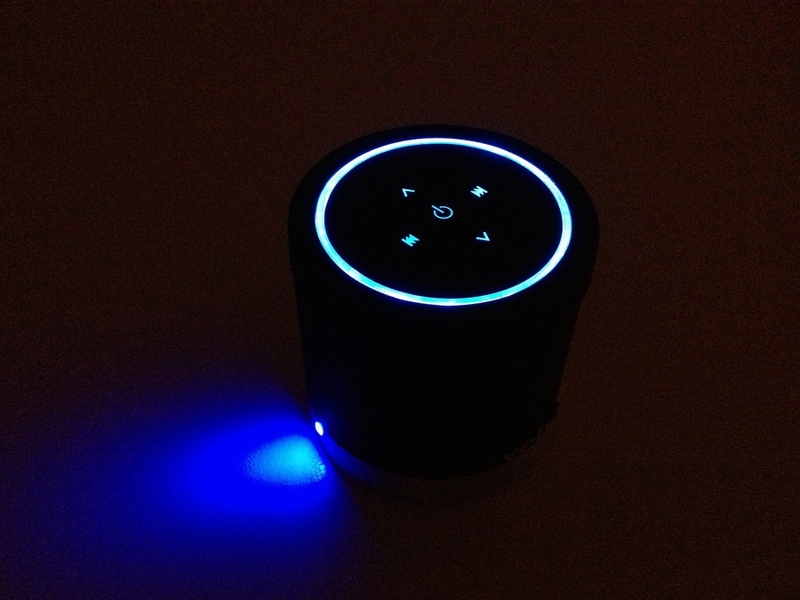 The latter has skip and volume controls, as this speaker also functions as a Bluetooth remote control. The power button also doubles as a Play/Pause button, but the instructions don't tell you this – you have to work it out for yourself. All of the control buttons are illuminated with blue LEDs too. So, you really have to like blue LEDs to live with this device. The Veho 360 M4 doesn't glare so much in normal lighting conditions. Pairing the M4 to a device is as easy as it can be without having NFC-driven 'tap to pair'. As soon as the device is turned on it is ready to pair – there's no arcane button sequence to press in order to make it ready. That leaves the pairing work to do on your smartphone. The instruction booklet says that the pairing PIN can be 1234 or 0000, so you may have to try both. The M4 undeniably (and according to the laws of physics) gives a much broader and richer sound than any smartphone speaker I've listened to. For that much, it's worth using, not to mention the freedom of a wireless connection. However, I was curious to see if it could match the bass performance of the X-Mini II speakers which I reviewed a while ago. Sadly, that was not the case, while the X-Mini II's can jump across the desk with their superlative bass resonance, even someone as insensitive to audio quality as I am could tell the bass was shallower in the M4. Again, this isn't a deal breaker IMHO. The worst part of the audio quality with the M4 was that on every device I tested it with, I could hear a high pitched beat, which marred listening to anything. This 'artefacting' would definitely make me look for an alternative speaker. The M4 also seemed quite susceptible to interference. In trying it around the house with various devices it could receive a signal in a house, through a wall and doorway up to roughly 12 meters. However, when I tried the speaker immediately beside my laptop's Nano USB Bluetooth dongle, I could interrupt the signal with my hand. For the record, I tested with the following devices: Nokia N8, Nokia Lumia 800, Nokia Lumia 920, Google Nexus 7, iPhone 4S, and a Windows 8 laptop. So the final question is: would I recommend you buy this? The M4 isn't a top quality piece of hardware, but neither is it sub-par by any reasonable measure. Veho's website prices this device at £59.95, I feel that is greatly overpriced – I would expect more features and higher quality for such a price tag. Other retailers are asking around £34.99, which isn't terrible, but compare that to the wired XMI X-Mini II speakers which can be had for as little as £13. If you can get a good deal on this speaker, then there are no show-stopping problems and it looks good. I'd hesitate to buy at the current prices though.